In A Pain in the Pullman the Three Stooges (Moe, Larry and Curly) are small-time, down on their luck actors (reduced to eating their shoes) who are continuing to practice (along with their pet monkey, Joe, who’s a part of their act) — and annoy the actor across the hall, “Paul Pain, the heartthrob of millions” — but fortune smiles on them when they get a call to take the place of an act that’s called in sick. This means that they have to pack their meager belongings in their trunk (which frankly cracks me up whenever I see it) and try to sneak out of their boarding house without paying their back rent and get to the train on time. 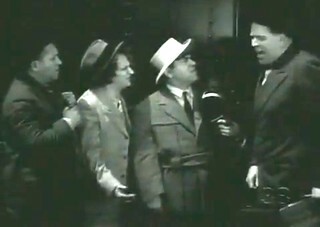 With help from Curly’s fertile imagination, they make it to the train station, but not in time to get their monkey into the baggage compartment, and so they sneak him aboard the train. They’re already in trouble with Johnson (played by Three Stooges regular Bud Jamison) who’s in charge of the troupe, and they keep irritating the star of the show — Paul Pain! 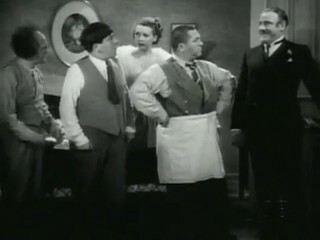 A harmless question about where they sleep leads to a funny scene where the Stooges mistake Paul’s drawing room for their own, and they proceed to eat his crab dinner — not realizing what it is; it’s a very funny scene as the clueless Stooges try to eat the “turtle”, with Curly throwing away the meat and eating the shell. More slapstick ensues when they try to accomplish the simple task of getting into their upper berth. …In one sequence, all three of us wound up in the same upper berth. Later, we found ourselves a drawing room, not knowing it was assigned to the star of the show (James C. Morton). There was a lovely table set in the room with all kinds of delicacies. At one point Curly picked up the hard-shelled Dungeness crab. We, of course, we’re not supposed to know what it was. Larry thought it was a tarantula, Curly figured it to be a turtle, and I concluded that it must be something to eat or it wouldn’t be on the table with crackers and sauce. As the scene progressed, Curly tried to open the crab shell and bent the tines of his fork. I took the fork from Curly, tossed a napkin on the floor, and asked him to pick it up. When Curly bent over, I hit him on the head with the crab, breaking the shell into a million pieces. Then Curly scooped out some of the meat, tasted it, and made a face. He threw the meat away and proceeded to eat the shell. I have to tell you, if there’s one thing to which I have an aversion, itâs shellfish, and I couldn’t bring myself — even for a film — to put that claw in my mouth. Preston Black, the director, asked me to just lick the claw, but I couldn’t. He finally had the prop man duplicate the claw out of sugar and food coloring and had me nibble on it as though I was enjoying it. I was still very wary during the scene. I was afraid they had coated the real shell with sugar and that that awful claw was underneath. I chewed that claw during the scene, but if you’ll notice, I did it very gingerly. In the meantime, Curly was still chewing on the shell, which was cutting the inside of his mouth. Finally, our star comes back to his room and kicks us out, and we three climb into our upper berth to go to sleep. This is the first short in which Moe, Larry, and Curly are actually referred to as “The Three Stooges” in the dialogue. The closing shot of the Stooges leaping over a bush, and landing on a trio of bucking steers was reused at the end of A Ducking They Did Go. Moe (Moe Howard): Joe’s right, we can’t eat the act. Moe (Moe Howard): What’s that? Curly (Curly Howard): Fillet of sole and heel. Paul Pain: I’m Paul Pain, the heartthrob of millions! Larry (Larry Fine): What’s a heart throb? Curly (Curly Howard): A pain in the neck! Nyuk nyuk nyuk! Moe (Moe Howard): [on phone] Yes? Yes. Yes! Larry (Larry Fine): What is it? Curly (Curly Howard): Yes what? Moe (Moe Howard): A job! Landlady: And where do you think you’re going without paying the rent? Moe (Moe Howard): Well, we were just on our way to hock the trunk so we can pay you. Landlady: Oh, no you don’t. I’m calling a policeman. Curly (Curly Howard): Hold it, no sense in calling the police, I’m a G-man. What’s all the fuss? Landlady: I want you to arrest these men. Curly (Curly Howard): [to Moe and Larry] You’re under arrest. Get that trunk along as evidence. C’mon, get going, c’mon. [to the Landlady] I’ll see they get time and a half for overtime, don’t worry about it. Landlady: Thank you, that’s very nice of you. [Realizes what just happened] Help, help, police, I’ve been robbed! Moe (Moe Howard): What is that? Curly (Curly Howard): Why, ya ignoramus, don’t ya know? Moe (Moe Howard): Well, wiseguys, what is it? Curly (Curly Howard): Want some? Actress: Oh, I just love crab! Curly (Curly Howard): She don’t know it’s a turtle! Moe (Moe Howard): Say, where’s our drawing room? Johnson (Bud Jamison): Your berth is up there! Curly (Curly Howard): What, three in one? Johnson (Bud Jamison): Yeah, what about it? Curly (Curly Howard): That’s what I thought you said. Sleeping woman: What’s the matter, dear? Curly (Curly Howard): I’m looking for Joe! Sleeping woman: Why didn’t you write? Curly (Curly Howard): I don’t know your address! Curly (Curly Howard): Get your foot out of my vest! Moe (Moe Howard): You’re spoilin’ the wardrobe! Moe (Moe Howard): [after Curly is thrown on top of him] Ya big lummox, ya wanna give me berth marks? Moe (Moe Howard): Hey, you! Wake up and go to sleep. 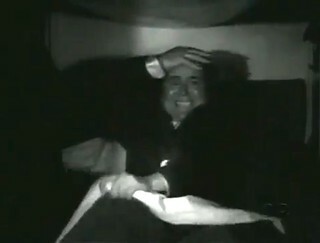 Johnson (Bud Jamison): Aren’t you guys asleep yet? Curly (Curly Howard): Soitenly! I dreamed we saw a swimming pool, so we dove in. Johnson (Bud Jamison): Dive back into that berth, or I’ll make you dive off of this train! Johnson (Bud Jamison): [hearing the monkey] What’s that I hear? Moe (Moe Howard): Aw, ya shouldn’t believe everything ya hear.